Make your next Golf Tournament memorable for every participant and vendor partner! Golf Tournaments are a fun and creative method to achieve business success through building relationships out on the greens. Let The Gift Planner help make your brand stand out. Reach greater business growth by showcasing your brand in new and unique ways. You'll drive a hole-in-one with our extensive gifts for your next golfing event. From tournament promotional items and fun giveaways, to top quality golf pro apparel and grand prize gifts, we have it all! Swing on in and find the ideal item for your favorite golf lover, or call us for help with finding that perfect, unique gift. Hit a hole in one with this great gift for the golfer in your life. 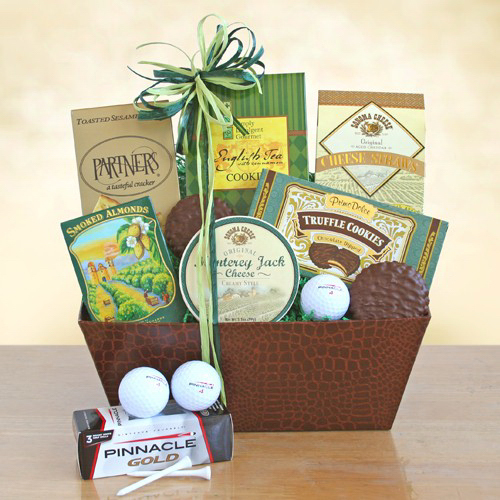 Our handsome keepsake box is filled with apres-golf goodies: cheese, crackers, cheese sticks, chocolate truffle cookies, smoked almonds, English tea cookies, three golf balls and a bunch of tees. Just right for the 19th hole! 16" x 10" x 8". 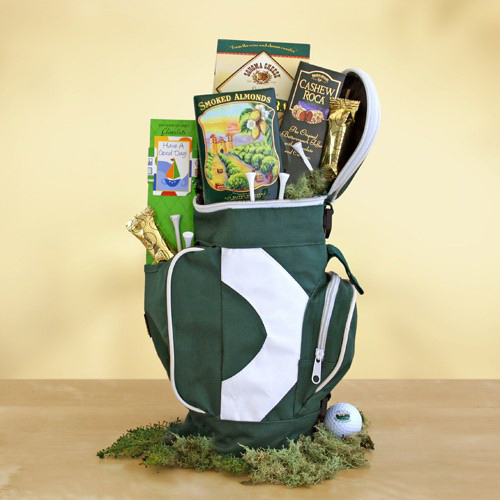 Let them know how much you appreciate them this holiday, both and on and off the course, with this fun golf gift of gourmet treats. They can tee it up on the back nine no matter how frosty the weather outside, with cashew Roca, smoked almonds, Sonoma cheese sticks, chocolate cookies and a package of golf tees! 16" x 10" x 6". Your golf outing or tournament will be one to remember when you market the KOOZIE(R) 6 Pack Cooler Golf Event Kit! 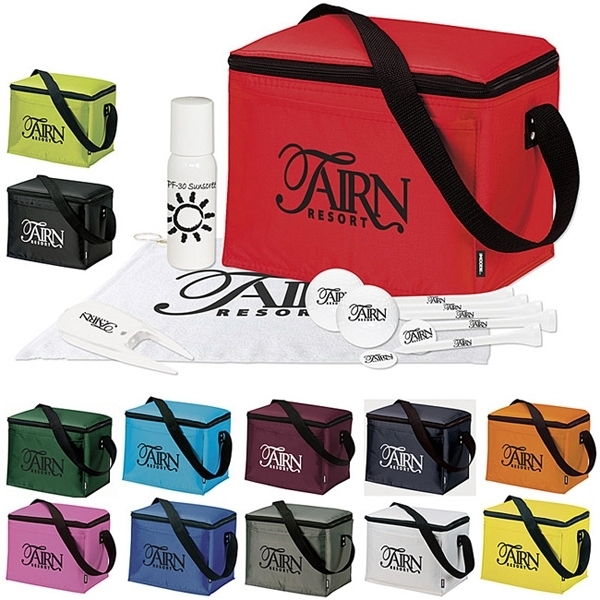 Our cooler is made of 70 denier nylon and includes two imprinted Ultra 500 golf balls, five imprinted 2 3/4" tees, two imprinted ball markers, one imprinted plastic divot repair tool, one imprinted towel and 1 oz. bottle SPF 30 sunscreen lotion. Components have black imprint and come in assorted colors unless specified. Keep your clubs dry with this Club Canopy umbrella! Featuring 20 inches of coverage, this convenient item folds to 33 inches and features a manual telescoping shaft, rubber golf grip handle, strong steel shaft, rib construction and a nylon sheath. The 4 Stormview side panels make it easy to see clubs while on the course and an imprint of your logo or company name will keep your brand front and center. 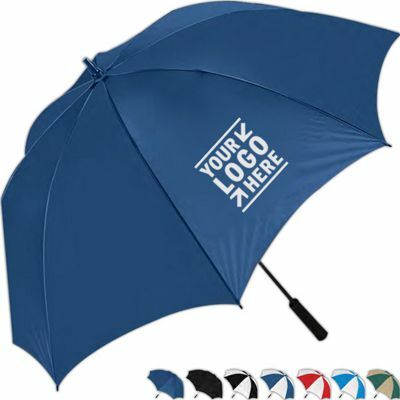 From country clubs to golf tournaments, this umbrella is a great giveaway at your next event! 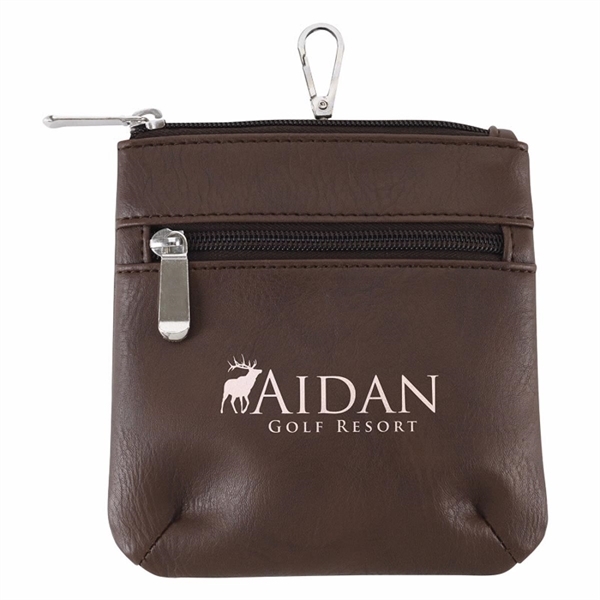 Throw back golf pouch perfect for tournaments. Keep all your golf accessories handy. Carabiner clip on the back of pouch. Front pocket helps for the smaller items. 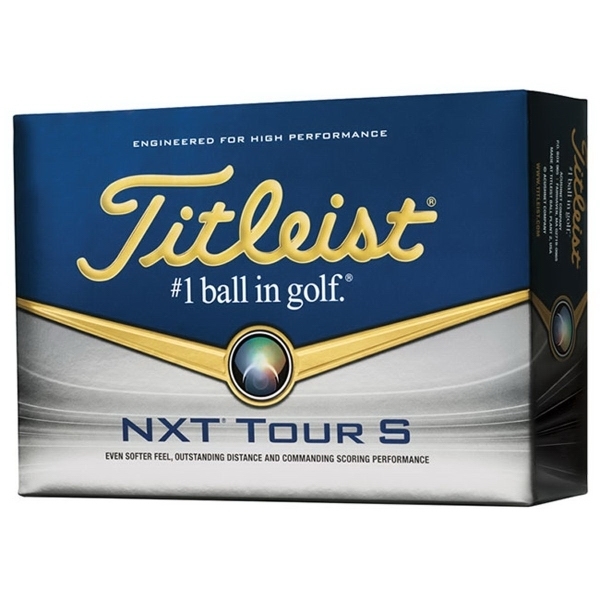 Be prepared for your big golf outing with the Titleist (R) NXT (R) Tour S Golf Ball Std Serv! Sold by the dozen, each ball includes a NXT Tour performance with a softer feel. Made in the USA, each white ball features proprietary soft compression highly resilient core with outstanding distance and consistent flight. Great for tournaments, gifts and promotional events, you have plenty of options to imprint a message, slogan or logo! Your brand can win the "title" for having the best promotional product when you market with theTitleist (R) Ultra Lightweight Golf Bag! The 9" x 36" x 13" is made of nylon with 4-point, easily adjustable, double strap assembly. 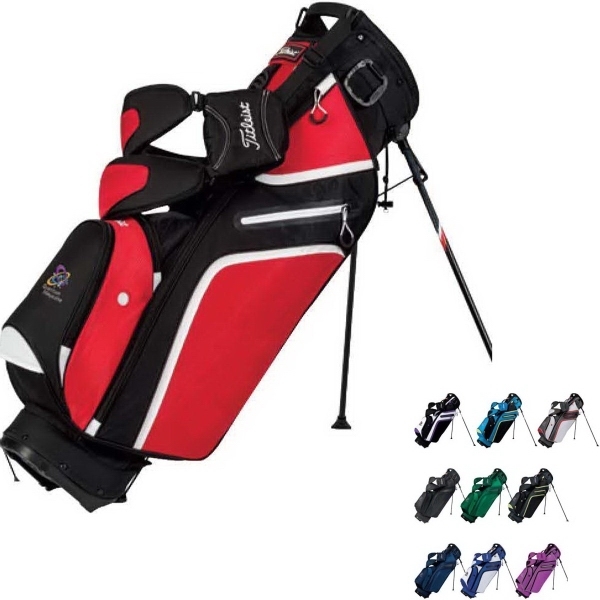 The bag features a foam pad, comfort mesh covered hip pad and dry grip bottom. Available in a variety of color options with room to imprint a personal message or your company name or logo! 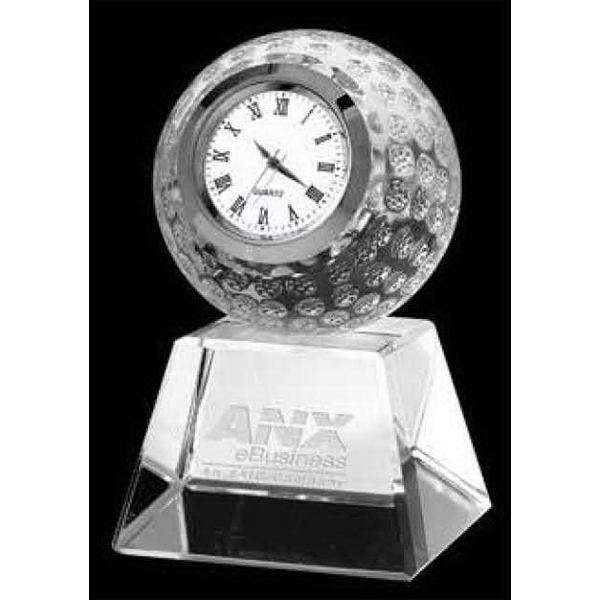 Optical crystal, golf ball-shaped clock with base. Japanese movement. 1 3/4" clock face. This beautiful crystal golf ball, complete with dimples, rests on an ebony crystal base. It features a classically styled clock with Roman numerals and uses a standard 377 watch battery which can easily be replaced by removing the back. A great gift for the avid golfer in your life. Is it tee time yet? Laser engraved. Take your game of golf to the evening skies by using these novelty light up golf balls! Available in four colors, this high-tech golf ball will provide up to a total of 36 hours of illuminated fun and excitement. Once the ball is activated, the two high powered LED lights will illuminate the ball for 8-10 minutes until the automatic shutoff turns off the lights to preserve battery life. After shutoff, all it takes is another strike of the ball to re-energize the circuitry for another 8-10 minutes. With customization options, it's a great giveaway for corporate sponsorship events, mini golf centers, pro shops and much more! Get your game on with this party tournament golf kit! It comes with everything you need to have a fun, successful time on the green. With this comes a cup, balm for your lips in a color tube, three balls, six tees, one divot tool, and a poker chip. Imprint this in one color on one location for each item with the option of using our 4-color process on the lip ointment and each ball. This is the perfect way to become who golfers go to for all of their needs! A promotional product worthy of a PAR - TEE! Featuring a 600 denier / PVC polyester exterior with black faux fur interior lining this sporty kit would be a great gift for loyal customers or generous sponsors. Includes a top zipper closure to keep items secure, an outside pocket for easy access and an exterior pen loop. Hang or attach to another item for superior functionality with accenting web and clip. Ideal for charity golf tournaments! Freshen up your promotional campaign with this sophisticated covering! When you choose from the 7 color options and add your custom imprint you're sure to garner attention every time it opens. Features a fiberglass shaft, windproof frame and EVA rubber handle. A 62" arc makes this product ideal for walking across campus or during unpredictable vacation weather. Perfect for business executives and frequent travelers. 39.5" overall length. Pack a lunch, bring some drinks and hit the golf course with your friends! 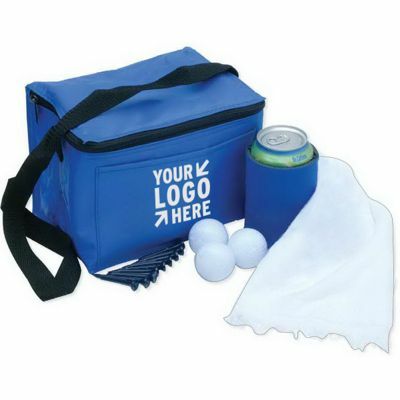 This tournament pack features a 6-pack cooler bag, as well as 3 white golf balls, nine 2 1/8" golf tees, a white golf towel, a collapsible can cooler. Three AuthoriTEE (TM) balls, and pick from array of colors for the cooler and tees. 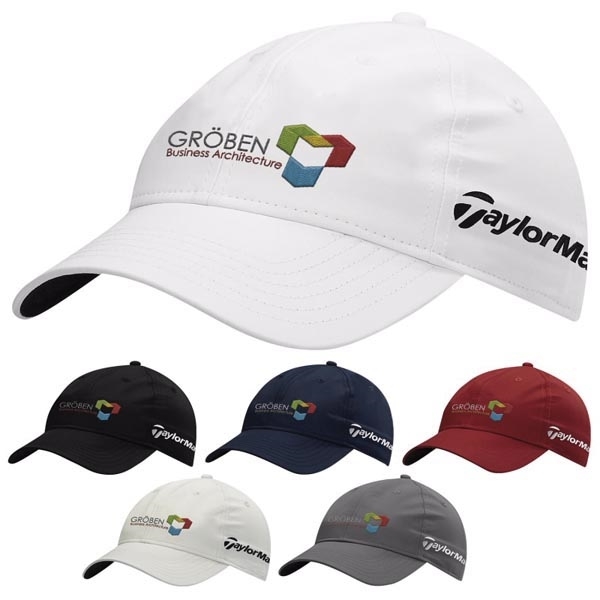 Includes a one-color imprint on each item and a 1-4 color imprint on pole of golf balls. Sleek design with TaylorMade (R) logo on the side of cap. Large area on front of cap for embroidery. Adjustable to fit most. Rubber dog bone in hanging package. Two golf balls on either end. Customize with your logo(s). 7.25" inches long It squeaks! Add a textured layer to your performance wardrobe with this Vansport (TM) textured stripe polo. Made of 100% polyester, this trendy 5 oz. top has a moisture-management textured striped body designed to hold up to harsh conditions. It features UV protection, a three-button placket, a tagless neck label, polished pearl buttons, a solid rib-knit collar, even-hem sleeves, a dropped tail bottom with side vents and double-needle top stitching. It is available in several colors and sizes and can be customized with your brand imprint for maximum exposure. Imported. 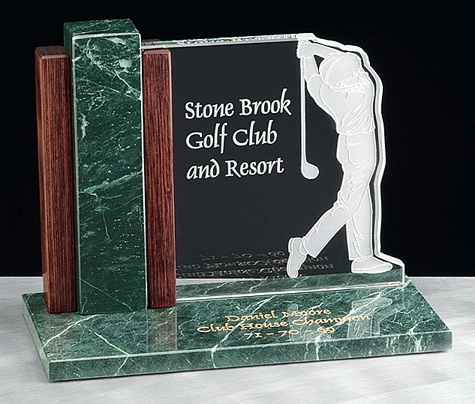 Links glass golf desk award with jade glass stock water jet cut man shape, sand etched, dymondwood and marble base. Shop More Golf Tournament Gifts!